At the onset of the Arab Spring in late 2010 and early 2011, many world leaders, including U.S. President Barack Obama, expressed hope that the political uprisings in the Middle East and North Africa would lead to greater freedoms for the people of the region, including fewer restrictions on religious beliefs and practices. But a new study by the Pew Research Center finds that the region’s already high overall level of restrictions on religion – whether resulting from government policies or from social hostilities – continued to increase in 2011. 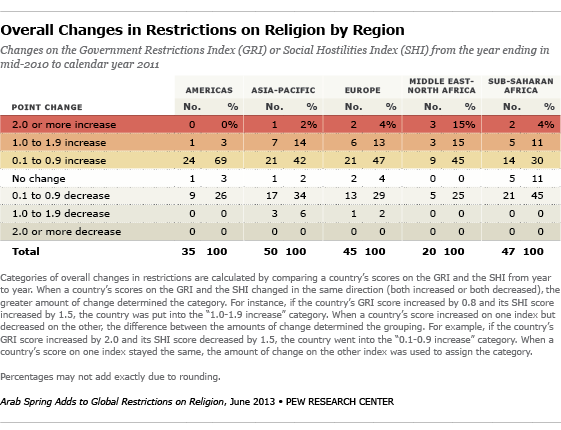 The Americas, Europe, sub-Saharan Africa and the Asia-Pacific region all had increases in overall restrictions on religion in 2011. Government restrictions declined slightly in Europe, but social hostilities increased. Asia and the Pacific had the sharpest increase in government restrictions, though the level of social hostilities remained roughly the same. By contrast, social hostilities edged up in sub-Saharan Africa, but government restrictions stayed about the same. 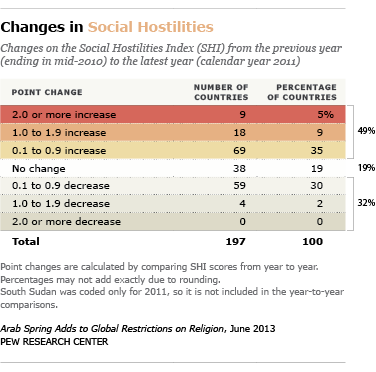 Both government restrictions and social hostilities increased slightly in the Americas. Globally, the share of countries with high or very high restrictions on religion rose from 37% in the year ending in mid-2010 to 40% in 2011, a five-year high. Because some of the most restrictive countries are very populous, more than 5.1 billion people (74%) were living in countries with high government restrictions on religion or high social hostilities involving religion, the brunt of which often falls on religious minorities. The Government Restrictions Index (GRI) measures government laws, policies and actions that restrict religious beliefs or practices. The GRI is comprised of 20 measures of restrictions, including efforts by governments to ban particular faiths, prohibit conversions, limit preaching or give preferential treatment to one or more religious groups. The Social Hostilities Index (SHI) measures acts of religious hostility by private individuals, organizations and social groups. This includes religion-related armed conflict or terrorism, mob or sectarian violence, harassment over attire for religious reasons and other religion-related intimidation or abuse. The SHI includes 13 measures of social hostilities. In addition to scoring countries on both indexes, the study looks at the extent and direction of change in government restrictions on religion within each country between the year ending in mid-2010 and the end of calendar year 2011. Among countries with modest changes (1.0 to 1.9 points), 10 had increases (5%) and three had decreases (2%).10 And among countries with small changes (less than 1.0 point), 84 had increases (43%) and 75 had decreases (38%). Considering all changes in government restrictions from mid-2010 to the end of 2011, regardless of magnitude, 49% of countries had increases and 40% of countries had decreases. The level of increase in government restrictions during the latest year studied was not as large as the increase in the previous year (from mid-2009 to mid-2010), when 63% of countries had increases and 25% had decreases. This study also looks at the extent and direction of change in social hostilities involving religion within each country between the year ending in mid-2010 and calendar year 2011. Among countries with modest changes (1.0 to 1.9 points), 18 had increases (9%) and four had decreases (2%).14 For example, Pakistan’s score on the SHI increased from 9.0 as of mid-2010 to 10.0 in 2011, making it the first country to score 10 out of 10 points on either index during the five years covered in this study. Not only was each of the 13 types of social hostilities involving religion present in Pakistan in 2011, but each was present at the highest level measured by the index. This includes religion-related war and terrorism, mob violence and sectarian conflict, hostility over religious conversion, harassment of women for violating religious dress codes, and all six types of malicious acts and crimes inspired by religious bias: harassment and intimidation; displacement from homes; destruction of religious property; abductions; physical abuse; and killings. Among countries with small changes on the Social Hostilities Index (less than 1.0 point), 69 had increases (35%) and 59 had decreases (30%). Considering all changes in social hostilities from mid-2010 to the end of 2011, regardless of magnitude, 49% of countries had increases and 32% of countries had decreases. The level of increase in social hostilities during the latest year studied remained unchanged from the previous year (from mid-2009 to mid-2010). 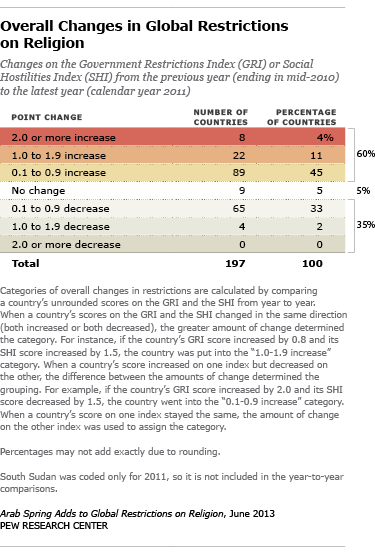 Overall, restrictions increased at least somewhat in 60% of countries and decreased in 35% between the year ending in mid-2010 and calendar year 2011. As was the case when the two indexes were considered separately, this is a slightly smaller margin of difference than during the preceding year, when 66% of countries had increases and 28% had decreases. The Government Restrictions Index and Social Hostilities Index each include a question about the harassment of specific religious groups (GRI Q.11 and SHI Q.1a). Harassment and intimidation by governments or social groups take many forms, including physical assaults, arrests and detentions, the desecration of holy sites and discrimination against religious groups in employment, education and housing. Harassment and intimidation also include such things as verbal assaults on members of one religious group by other groups or individuals. Harassment or intimidation of specific religious groups occurred in 160 countries in 2011, the same number as in the year ending in mid-2010. In 2011, government or social harassment of Muslims was reported in 101 countries; the previous high was 96 countries in the first year of the study. Jews were harassed in 69 countries in 2011, about the same as the year before (68 countries, which was the previous high). 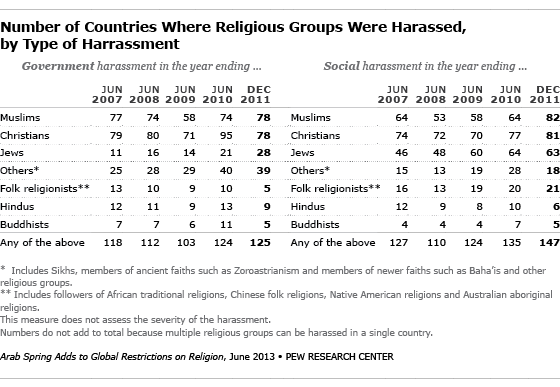 As noted above, harassment of Christians continued to be reported in the largest number of countries (105), although this represented a decrease from the previous year (111). Overall, across the five years of this study, religious groups were harassed in a total of 185 countries at one time or another. Adherents of the world’s two largest religious groups, Christians and Muslims – who together comprise more than half of the global population – were harassed in the largest number of countries, 145 and 129 respectively.17 Jews, who comprise less than 1% of the world’s population, experienced harassment in a total of 90 countries, while members of other world faiths were harassed in a total of 75 countries. 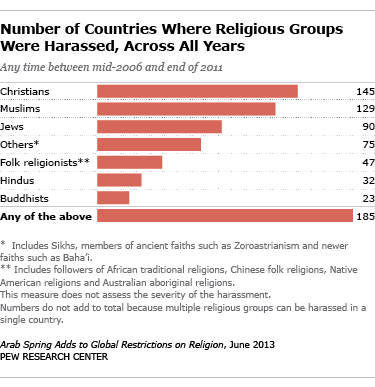 In 2011, some religious groups were more likely to be harassed by governments, while others were more likely to be harassed by individuals or groups in society. Jews, for instance, experienced social harassment in many more countries (63) than they faced government harassment (28). Similarly, followers of folk and traditional faiths faced social harassment in four times the number of countries (21) as they faced government harassment (5). By contrast, members of other world faiths, such as Sikhs and Baha’is, were harassed by some level of government in about twice as many countries (39) as they were by groups or individuals in society (18). Looking at the extent and direction of change on the Government Restrictions Index and the Social Hostilities Index together, increases of one point or more outnumbered decreases of that magnitude in all five regions. The Middle East-North Africa region had the largest share of countries with increases of one point or more (30%) and the largest share of countries showing any increase (75%). The Americas and sub-Saharan Africa had the lowest proportion of countries where overall restrictions increased by one point or more (3% and 15%, respectively). Asia and the Pacific and Europe were the only regions where decreases of one point or more occurred. 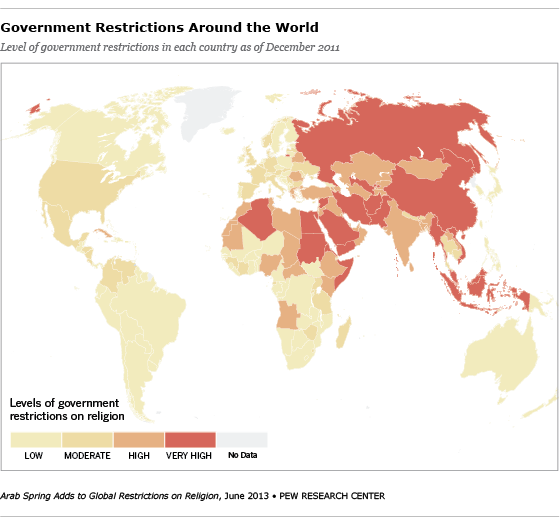 In the latest year studied, the Middle East and North Africa had the highest median level of government restrictions. (See Government Restrictions on Religion, by Region line graph.) The median score on the Government Restrictions Index for the 20 countries in the region in 2011 (5.9) was about the same as in the previous year (5.8). 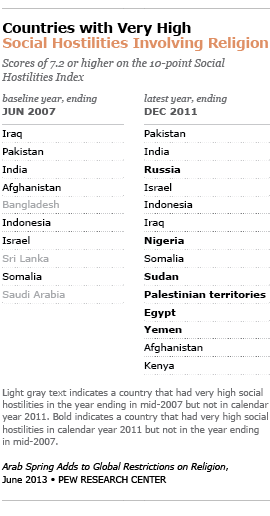 Government restrictions on religion remained high or very high in most of the countries that experienced the political uprisings known as the Arab Spring in late 2010 and early 2011.18 (See sidebar.) For instance, Egypt’s score on the GRI edged up from 8.7 as of mid-2010 to 8.9 in 2011. Eleven other countries in the Middle East-North Africa region also experienced increases in government restrictions: Algeria, Bahrain, Iraq, Kuwait, Libya, Oman, the Palestinian territories, Qatar, Sudan, Syria and the United Arab Emirates. Of the countries in the region, Bahrain had the largest increase in its score on the GRI, which rose from 4.2 to 6.2. The median GRI score for the 50 countries in the Asia-Pacific region increased from 3.4 in mid-2010 to 4.2 in 2011. In part, this was because three countries had increases of one point or more (Armenia, Mongolia and Pakistan), while only one country – the island nation of Tuvalu – decreased by that amount. Median scores on the Government Restrictions Index declined slightly in Europe and stayed the same in sub-Saharan Africa. And, continuing a three-year trend, government restrictions in the Americas rose during the latest year studied. Although the median level of government restrictions in the Americas was relatively low in 2011 (1.5), one country, Cuba, had high and rising restrictions. Cuba’s GRI score increased from 4.8 as of mid-2010 to 5.3 in 2011. Eight other countries in the region, including the United States, were in the moderate category. 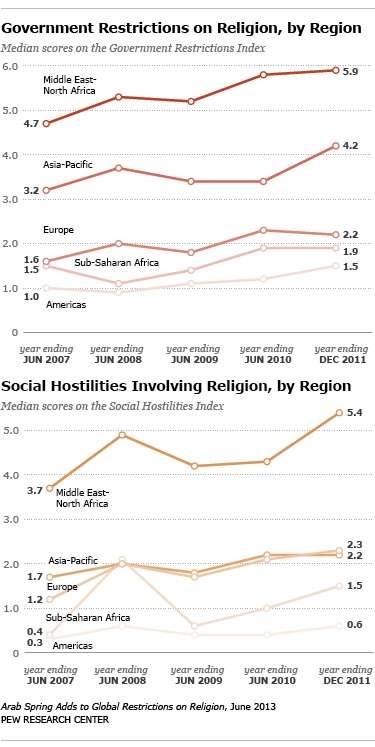 As with government restrictions, social hostilities involving religion were highest in the Middle East and North Africa. Indeed, the region’s median score on the Social Hostilities Index rose substantially, from 4.3 as of mid-2010 to 5.4 in 2011, a five-year high. Social hostilities increased in 14 of the 20 countries in the region and declined in only four. The largest increases were in Sudan (whose score rose from 5.o in the year ending in mid-2010 to 7.8 in 2011), Tunisia (1.0 as of mid-2010 to 3.5 in 2011) and Syria (3.3 as of mid-2010 to 5.8 in 2011). In Europe, social hostilities involving religion increased in more than twice as many countries (27) as they decreased (12). 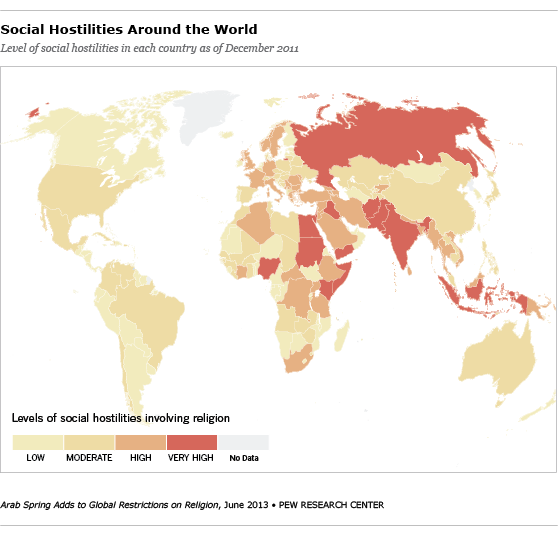 Social hostilities in Russia were very high as of mid-2010 and remained very high in 2011. Six countries in the region went from having moderate to high levels of social hostilities: Bulgaria, Italy, Moldova, Montenegro, Norway and Sweden. Two countries had large increases of 2.0 points or more: Bulgaria and Norway. Some of the increase in Norway was attributable to the mass shooting and bombing by Anders Behring Breivik in July 2011. The median level of social hostilities increased slightly in the Americas (from 0.4 to 0.6) but remained relatively low. None of the 35 countries in the region had high social hostilities, but in 2011, eight countries (Brazil, Chile, Colombia, Cuba, Haiti, Mexico, the United States and Venezuela) had moderate hostilities, a slight increase from mid-2010, when five were in the moderate category. Among the world’s 25 most populous countries, Egypt, Indonesia, Russia and Pakistan stand out as having the most restrictions on religion (as of the end of 2011) when both government restrictions and social hostilities are taken into account. Brazil, the Philippines, Japan, the United States and Mexico have the least restrictions and hostilities. Note: For 2007-2010, the index scores are for the 12-month period ending in June of that year. For 2011-14, the index scores are for the calendar year. The center of each circle is positioned on the average index score for each country. Source: Pew Research Center analysis of external data. See Methodology for details. 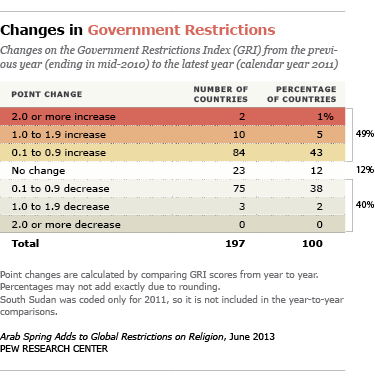 "Trends in Global Restrictions on Religion"
These are among the key findings of the Pew Research Center’s assessment of global restrictions on religion in calendar year 2011. The 198 countries and self-administering territories covered by the study contain more than 99.5% of the world’s population. They include 192 of the 193 member states of the United Nations as of 2011 (including South Sudan) plus six self-administering territories — Kosovo, Hong Kong, Macau, the Palestinian territories, Taiwan and Western Sahara.23 Each country or territory was scored on a total of 33 measures phrased as questions about government restrictions or social hostilities involving religion. (For the full question wording, see the Summary of Results.) The Government Restrictions Index is comprised of 20 questions; there are 13 questions on the Social Hostilities Index. The researchers involved in this process recorded only concrete reports about specific government laws, policies and actions, as well as specific incidents of religious violence or intolerance by social groups; they did not rely on the commentaries or opinions of the sources. (For a more detailed explanation of the coding and data verification procedures, see the Methodology.) The goal was to devise a battery of quantifiable, objective measures that could be analyzed individually as well as combined into two comprehensive indexes, the Government Restrictions Index and the Social Hostilities Index. Readers should note that the categories of very high, high, moderate and low restrictions or hostilities are relative – not absolute – rankings based on the overall distribution of index scores in the initial year of this study. As such, they provide a guide for comparing country scores and evaluating their direction of change over time. They also reflect the number and severity of various kinds of restrictions or hostilities that occurred in any part of a country. Accordingly, more populous countries may have a higher likelihood of scoring higher than less populous countries, though in practice, some countries with very high levels of restrictions or hostilities, such as the Maldives and the Palestinian territories, have relatively small populations. Finally, it is very likely that more restrictions exist than are reported by the 19 primary sources. But taken together, the sources are sufficiently comprehensive to provide a good estimate of the levels of restrictions in almost all countries. The one major exception is North Korea. The sources clearly indicate that North Korea’s government is among the most repressive in the world with respect to religion as well as other civil and political liberties. (The U.S. State Department’s 2011 Report on International Religious Freedom, for example, says that “Genuine freedom of religion does not exist” in North Korea.) But because North Korean society is effectively closed to outsiders and independent observers lack regular access to the country, the sources were unable to provide the kind of specific, timely information that Pew Research categorized and counted (“coded,” in social science parlance) for this quantitative study. Therefore, the report does not include scores for North Korea.